I heard that Blackridge opened this week and that there was a group going out there last night. I decided to try and meet up with them to check it out. We ended up stuck in traffic and got there late. There were still a few people in the water, but they were just wrapping up. I got in and swam a couple loops. The water was more murky than I remembered from last year. Each lap took about 6 minutes so it must only be about 400 yards around. I met up with Kris after the second loop and chatted with her for a while as another group was getting in the water. I did one more loop and then played with my boys for a bit before heading home. I didn't take the temperature, but I suspect it was upper 60's. 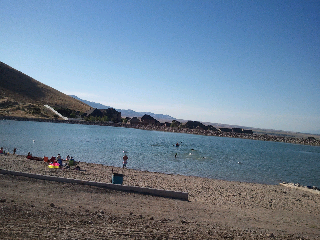 This is a great little "lake" for triathlon training and fun with the family, but not the best for distance swims.